The first court house ever erected in Rossland was located on the lot now occupied by Alpine Drug Mart (2060 Columbia Ave .) in 1894. This building also had the distinction of being the second building ever constructed in Rossland. The hewn log building served as the Provincial Government offices, the jail, and court house in Rossland for a year (Kingsmill, 3). 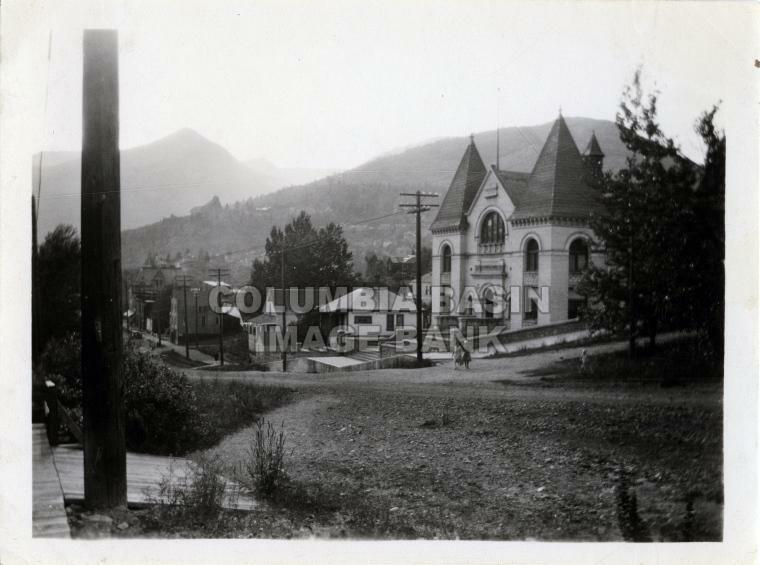 The second court house was located on the north side of Columbia Ave. west of Spokane St. up against the rock bluff. The court house remained there until Rossland was incorporated in 1897, at which time plans for a larger court house to accommodate the growing city were being discussed. The chosen location was the corner of Columbia Ave. and Monte C(h)risto, although it was not an ideal site because of the steep incline. Construction began in 1898. 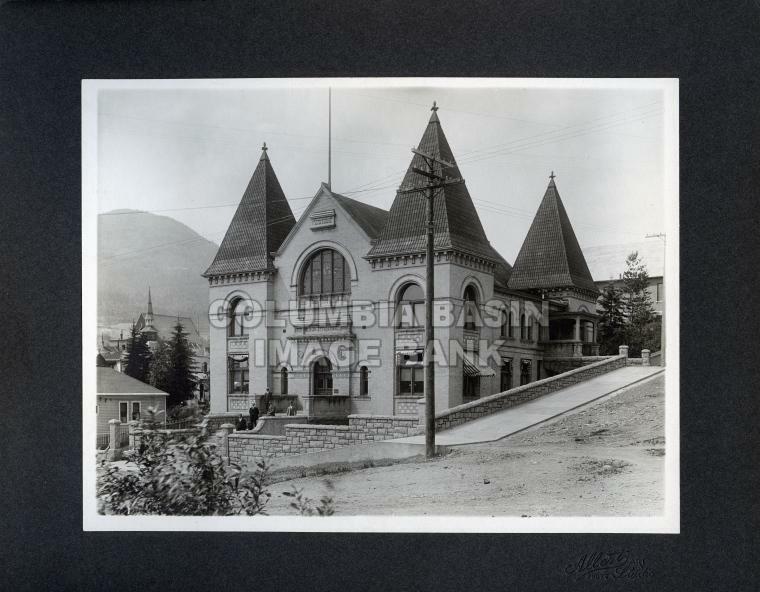 Mr. John J. Honeyman, a Scot who made his home in Rossland, was the architect who designed the Rossland Court House. Honeyman borrowed a few features from Francis Rattenbury’s Nanaimo Court House, which is noted in the following quote: “The front facades of both are dominated by symmetrical corner towers topped with pyramidal roofs. Honeyman extended this feature by adding an additional tower at the rear of his design, thereby giving a curious fortress-like appearance to the building” (Mills,161). The Rossland Miner newspaper reviewed the opening ceremonies in a lengthy article on May 31, 1901. The article stated that Mr. Justice Martin presided over the ceremony, “attired in a crimson robe deeply edged in ermine.” The members of the bar wore conventional wigs and gowns while their wives observed from the jury box. 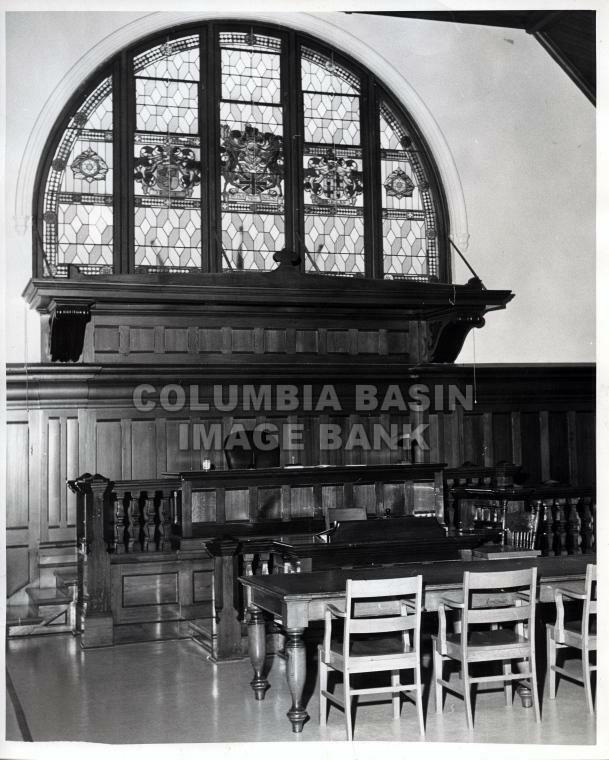 The interior of the Court House was decorated for the grand opening. The citizens of Rossland were pleasantly surprised to find that the carpeted floors held arrangements of palms and other plants. James Lawn, a local contractor, received the contract to construct the Court House, as his low bid of $38,500.00 was accepted. Lawn worked on the building for a period of one year and then quit before completion. The Department of Public Works took over construction after Lawn’s departure. The final cost of the building was $53,000.00, exceeding projected costs. The court room is demonstrative of the exquisite woodwork which is found throughout the building. The following excerpt from the Rossland Miner described what the court room would look like after its completion: “[The Court Room] is finished with half open timber roof, the hammer beam truss being used with matched cedar laid diagonally and in panels — the roof principals being filled in with simple tracery in cedar. The heavy square moulded balusters in front of the public gallery, the high wainscot in paneled cedar with surmounting cornice carried to the height of the doors, the heavy scroll work over the doors, remind one somewhat of Tudor or Elizabethan days and harmonize with the solemnity and dignity of a court of justice” (Rossland Miner, July 28, 1898). The court room has been preserved and has escaped the “modernization” inflicted on many heritage buildings. The most impressive attraction to the court room is the 9’ x 15’ stained glass window. The Rossland Miner also provided a detailed description of the stained glass window: “In the central compartment are the arms of British Columbia which are guarded by a cariboo and a mountain sheep. The center of the shield is occupied by the Union Jack, over which is the rising sun. This is surmounted by a coronetted helmet over which is a crowned lion. Below is the scroll “Splendor Sine Ossasu”. Flanking this blazon are the arms of Matthew Bailey Begbie, the first Chief Justice of British Columbia, and of Sir James Douglas. The whole will be rendered in colour and with the mid-day sun shining through, should look particularly well over the canopied seat of justice” (Rossland Miner, September 22, 1900). The first floor of the Court House held the Provincial Government offices, including the Government Agent’s office. In the 1930’s, part of the first floor was set aside for a Government Liquor Store (Mills, 164). The basement, used at one point as a jail, housed Rossland’s library for many years until 1984 when the new library was completed. The second floor is where the Court room is situated, flanked on either side by Judge’s Chambers, Barrister’s room, Law Library, a smaller Court room, and Sheriff’s office. Information compiled by Sheila Corrado for the Rossland Commercial Heritage Inventory (July, 1984).